Yallingup is the pretty coastal settlement that we’ve used as our base for our last couple of trips down to the South West Cape Region of WA. As you will have gathered from last week’s post (Yallingup Part 1) it is a beautiful, unspoilt and relatively remote part of the world. You certainly need a car to travel down from Perth (the train stops at the port town of Bunbury (about 50 kms to the north). The roads are dark and not too well lit at night so unless you’re staying in a larger settlement such as Dunsborough, Busselton or Margaret River it is better to drive off and explore the region during the day and head home early evening to enjoy some local produce with a glass or 2 of the local wines. We opted for the self catering apartments of the Seashells Resort. Attractively designed to blend in with the surrounding gardens and bushland they were modern, tastefully decorated and cosy. However the one thing they lacked was an open wood fire. It does get considerably cooler than Perth down here especially during the winter months and although the apartments were warm and toasty, you can’t beat the charms of a real wood fire in my book! Fortunately you don’t need to travel too far to find one. Adjacent to Seashells you’ll find Caves House – the only pub and hotel in the township. If you want to eat out or find some entertainment in the evenings Caves House is pretty well “it”! The original Caves House Hotel was built by the WA Government in 1903 to provide accommodation for visitors coming down to see the newly opened caves nearby. Sadly it was destroyed by fire in December 1930 (see here for a newspaper report from the era). This unfortunate event resulted in the construction of the current hotel in 1938 (historic by Western Australian standards). The architecture of Seashells Resort was in fact designed to fit in with the 1930s art deco style of Caves House. 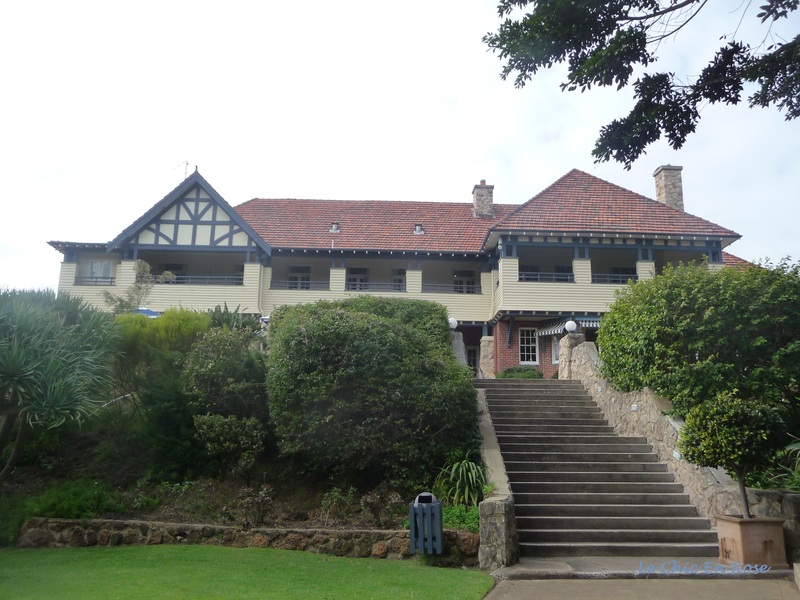 Heritage listed, Caves House is well known as a local music venue (especially with its Sunday Sessions during summer) and is also a popular venue for weddings and functions. On this particular late winter’s night though, a bitterly cold wind was howling in from the Indian Ocean making the temperature seem even colder than the 7 or 8 degrees it actually was. We were greeted with the sight of a roaring log fire and a cosy sitting area nearby – very welcome! We took our drinks over and waited for our evening meal to arrive (good hearty pub food – just what we needed after the drive down from the city). The gardens could have come straight out of an Edwardian country garden. Lush and green they are beautifully maintained and like the house are also heritage listed. The Emily Rose Terrace overlooking the gardens is a popular location for wedding ceremonies! A walking trail leads from the back of the property right the way down to Yallingup Beach (it takes about 20 minutes at a fairly leisurely pace). Simply follow the steps down to the path and keep walking. Cutting through a little valley with trees and shrubbery on either side it made for a pleasant way to start the day. Suddenly you come out from the wooded pathway and find yourself in a residential street in Yallingup. From here, however, it’s only a couple of minutes walk until you reach the lookout point above Yallingup Beach. Such pretty views and walk leading up:). The walk was so pretty leading up and down to the house – could see why it is a popular spot for wedding parties! It was lovely to sit by the fire Gin – the “hike” was just from our holiday apartments next door!! You got a prime spot by that log fire Rosemary – looks so inviting there, I agree, in winter you just can’t beat sitting by a real fire. I suppose if you had had one in your apartment though you wouldn’t have wanted to leave and explore!! Gorgeous scenery again, that beach and those sea views are stunning. It looks like a great place to relax. I love the veiw of the beach and the sea. I think I would be able to sit there for hours. That fire looks so welcoming on a cold night.